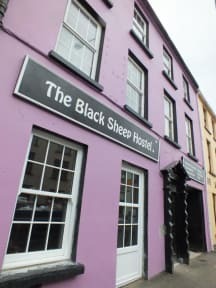 The Black Sheep Hostel kohteessa Killarney, Irlanti: Varaa nyt! The black sheep hostel is the best hostel I have ever stayed at. It is near the town centre, staff is really nice, rooms are clean and it is nice to have a little own place while sleeping. The curtains are such a good idea! I enjoyed my stay very much. If I am some day coming back to Killarney, I would like to stay at this hostel again. Absolutely the nicest place in which I've ever stayed, including hotels. The staff was extremely friendly and the space is beautiful. I would come back to Killarney just to stay in this hostel again! They had an extra 4 person bedroom which they gave to us free of any additional charges, it was extremely clean and the kitchen was spotless. I couldn't imagine a better experience in a hostel. If you're going to Killarney you have to stay here! It would have been nice to have more space/table in the toilet for your stuff. Very cozy hostel and it was nice to have the curtain in the bed, but it was little bit noisy because we had to keep the window open during the night.